The Asian-African Legal Consultative Organization has its permanent Headquarters at New Delhi, India. The relationship between Host Government, India and AALCO is governed by the Headquarters Agreement Between The Government of The Republic of India And The AALCO. The Secretariat of the AALCO is responsible for the daily functioning of the Organization. This includes primarily the preparation of technical studies and documentation, provision of advisory services to the Governments of the Member States, organization of training programs for legal officers of the Member States, and maintaining the necessary cooperation with UN, its Agencies and other regional and universal inter-governmental organizations in fulfilling the Organization’s objectives as an advisory body to its Member Governments in the field of international law, as well as a forum for Asian African cooperation in legal matters of common concern. The Secretariat is headed by a Secretary-General appointed by the Member countries. A national of a Member State who is a legal expert or having adequate legal expertise and administrative experience is eligible for such an appointment. The term of the Secretary-General is for four years. The person so appointed shall be eligible for re-appointment for only one further term of four years. He is assisted by Deputy Secretaries-General and Assistant Secretaries-General seconded by the Member Governments. The Secretary-General is the Chief Executive of the Organization. He will act on behalf of the Organization in all correspondence, and in the implementation of all decisions taken by the Organization. He shall also perform such other administrative duties as are necessary for the effective functioning of the Organization. 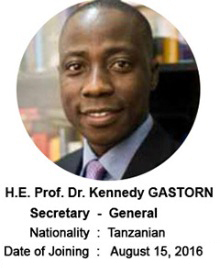 The current Secretary-General is Professor Dr. Kennedy Gastorn, Government of Tanzania. Senior officers deputed by the Member Governments who are working at the Secretariat currently are: Mr. Yukihiro Takeya, Deputy Secretary-General seconded by the Government of Japan, Ms. Wang Liyu, Deputy Secretary-General seconded by the People’s Republic of China and Dr. Ali Garshasbi, Deputy Secretary-General seconded by the Islamic Republic of Iran. The Secretariat staffs consist of different categories such as Legal Officers, Senior Legal Officers and Director, in the professional category and Administrative and Supporting staff. The Organization also maintains permanent observer mission to United Nations both at New York and Vienna.